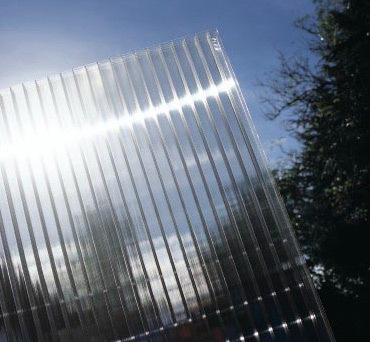 Cut-to-Size 25mm Polycarbonate Rectangles are supplied in Clear, Bronze, Opal, Bronze-on-Opal or Heatguard-on-Opal. Maximum length: 4,500mm. Minimum length: 500mm. Maximum width: 2,095mm. Minimum width: 500mm. Maximum width: 2,100mm. Minimum width: 500mm. · 25mm Clear = 51%. · 25mm Bronze = 25%. · 25mm Opal = 44%. · 25mm Bronze-on-Opal = 8%. · 25mm Heatguard-on-Opal = 7%. ‘U’ Value for 25mm Clear Bronze and Opal Polycarbonate = 1.5. ‘U’ Value for Bronze-on-Opal and Heatguard-on-Opal = 1.4. 25mm Heatguard-on-Opal Polycarbonate reflects upto 50% of Solar Heat. The main application is Conservatory Roofing. I would recommend your affordable products (Multiwall Polycarbonate Glazing Sheets | Cut to Size Multiwall Polycarbonate Rectangles | 25mm Polycarbonate) to anyone else considering this product, as it has been superb. Omega Build Shop | Multiwall Polycarbonate Glazing Sheets | Cut to Size Multiwall Polycarbonate Rectangles | 25mm Polycarbonate. You are viewing Multiwall Polycarbonate Glazing Sheets | Cut to Size Multiwall Polycarbonate Rectangles | 25mm Polycarbonate, buy online today!